SAN JOSE, Calif. – May 1, 2018 – Cisco (NASDAQ: CSCO) announced today its intent to acquire Accompany, a privately held company based in Los Altos, Calif. The company provides an AI-driven relationship intelligence platform for finding new prospects, navigating the selling process, and strengthening relationships. Accompany Founder and CEO Amy Chang will join Cisco as senior vice president in charge of the Collaboration Technology Group. The acquisition of Accompany will enable Cisco to take collaboration to the next level with even more intelligence. Accompany's AI technology and talent will help Cisco accelerate priority areas across its collaboration portfolio, such as providing user and company profile data in Webex meetings. 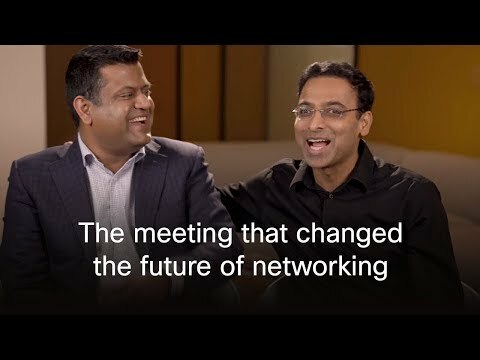 Together, Cisco and Accompany will continue to power the future of work in a smarter way to enhance customer experiences. "Amy has proven to be an effective and innovative leader through her years as an entrepreneur, an engineer, and CEO, and I couldn't be more pleased to have her and the Accompany team join Cisco," said Chuck Robbins, Cisco chairman and CEO. "Together, we have a tremendous opportunity to further enhance AI and machine learning capabilities in our collaboration portfolio and continue to create amazing collaboration experiences for customers." "I am thrilled with the opportunity to join Cisco and the industry's leading collaboration team," said Amy Chang, Accompany founder and CEO. "Enterprise applications are rapidly becoming more intelligent and augmented with data and pertinent information in real-time. By combining Accompany's relationship intelligence capability with Cisco's award-winning collaboration product portfolio, customers will be able to more intelligently collaborate with employees, customers and partners." Rowan Trollope, current senior vice president and general manager of the Collaboration Technology Group is taking the next step in his career and leaving Cisco to become CEO at another company effective May 3. Chang, who has served as a member of Cisco's Board of Directors since October 2016, has in conjunction with the transaction resigned from the Cisco Board of Directors effective immediately. Cisco will acquire Accompany for $270 million in cash and assumed equity awards. The Accompany team will join the Cisco Collaboration Technology Group under Chang's leadership. The acquisition is expected to close in Cisco's fourth quarter of fiscal year 2018, following customary closing conditions. This press release may be deemed to contain forward-looking statements, which are subject to the safe harbor provisions of the Private Securities Litigation Reform Act of 1995, including statements regarding the acquisitionenabling Cisco to take collaboration to the next level with even more intelligence, Accompany's AI technology and talent helping Cisco accelerate priority areas across its collaboration portfolio, further enhancing AI and machine learning capabilities in Cisco's collaboration portfolio, the expected benefits to Cisco and its customers from completing the acquisition, and plans regarding Accompany personnel. Readers are cautioned that these forward-looking statements are only predictions and may differ materially from actual future events or results due a variety of factors, including, among other things, that conditions to the closing of the transaction may not be satisfied, the potential impact on the business of Accompany due to the uncertainty about the acquisition, the retention of employees of Accompany and the ability of Cisco to successfully integrate Accompany and to achieve expected benefits, business and economic conditions and growth trends in the networking industry, customer markets and various geographic regions, global economic conditions and uncertainties in the geopolitical environment and other risk factors set forth in Cisco's most recent reports on Form 10-K and Form 10-Q. Any forward-looking statements in this release are based on limited information currently available to Cisco, which is subject to change, and Cisco will not necessarily update the information.